... in all its pink-bricked glory (please forgive the lame mantel decor - I got started and then never finished). The brick is the same as on the exterior of our house and it really looks a lot more pink than the picture shows :( And, you can sort of see that it is a corner fireplace, with about 12" of wall space on either side. The wall color (Valspar Desert Fortress) is relatively new so it will be staying. In the last couple of years (yes, these things take me awhile!) this room has taken on a beachy, country, farmhouse sort of feel. 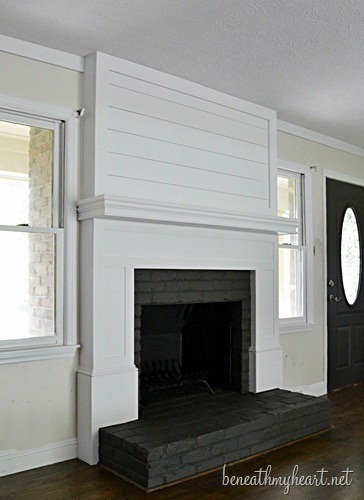 So, my grand vision for this space includes doing something with the brick to get rid of the pink, changing the mantel, and probably finishing off the wall above the mantel with beadboard and crown molding (since we used beadboard here and here). And, since this will have to be a LOW budget make-over, it will be done in stages, starting with the brick. So, what do you think? Whitewashed brick or painted? 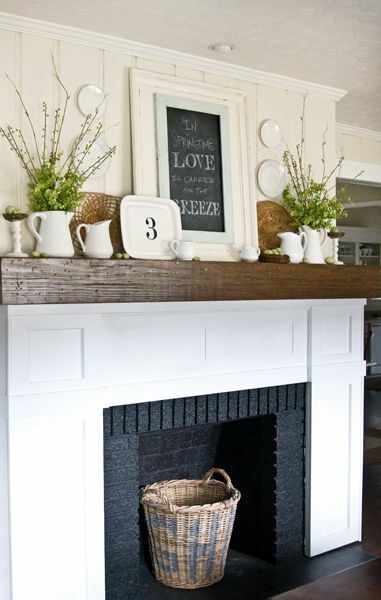 White mantel or wood (similar to our breakfast bar here)? Beadboard above? Replace the current screen? With what? Do you have any summer projects?